Featured grave spaces are defined at the first two rows deep along the roadway, $600 for each grave. A $300.00 surcharge will be added for Saturday burials and a $200 surcharge for burials on a holiday. No burials will be held on Sunday. $100 interment for cremated remains. $100 for burial in a child grave space. All foundations for monuments shall be poured by the Cemetery Sexton at a cost of .50 per square inch for foundaitons up to 576 square inches. Foundations 577 square inches or larger, or for any monument which, because of its dimentions and/or weight requires a larger or heavier foundation, are .75 per square inch. A half-acre lot was purchased in 1839 on the northwest corner of what is now Western and Delano Avenues for a Catholic Cemetery. Land was then purchased in 1858 on what was then known as Limestone Blvd., but now known as Allen Avenue. Land was purchased on the north side of the street approximately a half block from the intersection with Vine Street. At that time, half of the cemetery was used by St. Peter’s for the German Catholics and the other half was utilized for the burial of Irish Catholics by St. Mary’s. Burials were removed from the original site on Western and Delano Avenues and placed in the new cemetery on Allen Avenue. In May 1892, representatives from St. Peter’s and St. Mary’s Churches met to discuss acquiring land to be used for burial grounds. This new area would replace the old burial grounds that were located on Allen Avenue. The Franciscan Brothers of Cincinnati owned land on Worthington Avenue that had been deeded to them by Mrs. Sarah Peters. This 21 acre plot of land was originally owned by Governor Thomas Worthington and was part of his Adena Estate. It was hoped that a boys’ school could have been established there, but it became impractical to carry out. So the donor and their heirs agreed to allow the land to be utilized for a Catholic Cemetery. The Cemetery became known as St. Margaret’s Cemetery. Margaret Watts, the granddaughter of Thomas Worthington, was the benefactor that allowed Mrs. Peters to make the donation. Thus, the Cemetery is named after her to recognize her generous donation to the Catholic community. The cemetery on Allen Avenue was then abandoned after the acquisition of the land on Worthington Avenue. Burials that had been located at the Allen Avenue cemetery were then removed and reburied at the new location on Worthington Avenue. St. Margaret’s Cemetery is still being used today for the burial of Catholics. The current sexton of the Cemetery is Charlie Dawes and is also overseen by a committee consisting of the Pastors of both parishes and representatives from both parishes that are appointed by the pastor. 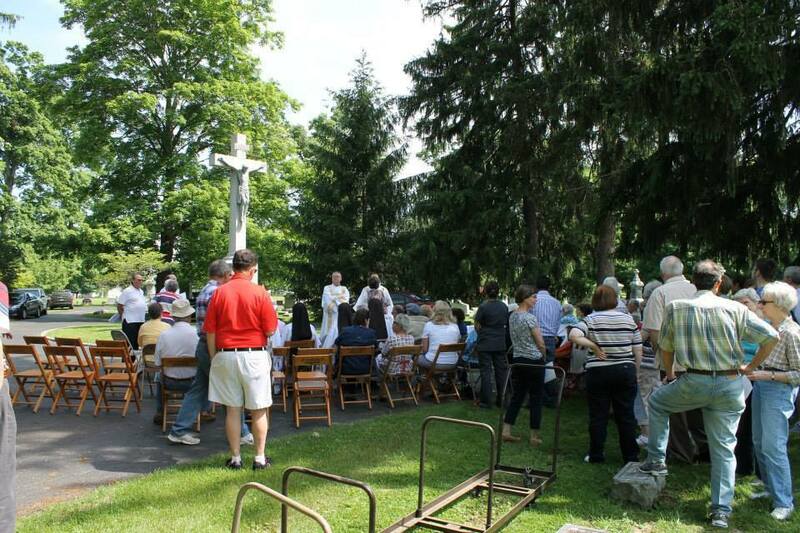 Each year, a Mass is held at the priests’ circle on Memorial Day. On the first Sunday of November, a prayer service is held to remember our departed loved ones who are buried at the cemetery. Three years ago, the St. Peter Military Ministry started honoring our deceased veterans buried there by participating in Wreaths Across America, which is held the second Saturday in December at noon. The complete code of Cemetery rules is found in the Rules and Regulations handbook. Copies of the revised edition of the handbook are available from any Board Member or by contacting Sexton Charles Dawes. The Board of Trustess may enact new regulations, or amend current ones, as needed. Hours of Cemetery - 8:00 a.m. until sunset. Visiting the Cemetery after sunset is in violation of state law. Artificial flowers and artificial foliage are prohibited in the Cemetery from March 15 through November 15. Children under the age of 12 are not permitted in the Cemetery unless accompanied by an adult responsible for them. Pets are not allowed in the Cemetery at any time. All transfers of burial rights (deeds to burial spaces) must be processed through the Board. Transfer of burial rights for purposed of personal profit of the holder is prohibited by state law. Cemetery monuments are the personal property of the owner and should be insured through the owner&apos;s personal property policy. Monument designs and inscriptions should reflect Christian values and are subject to prior Board approval. All monuments must be approved by the officers of the Association prior to placement in the cemetery.